Figure 1: Kelvin Hughes SharpEye™ SxV X-Band Doppler radar. Perimeter radars (or Perimeter surveillance radars) is a class of radar sensors that monitor hostile activity on the surroundings of critical infrastructures or objects worthy of protection. Such radars typically have ranges of several hundred metres to over a couple of 10 kilometres. They operate at very high frequencies, mostly in X–, Ku-Band or use millimeter waves with narrower beams to provide high accuracy and resolution. Perimeter radars are often part af a security network. The radar autonomously detects movement in a defined area, tracks those targets and raises an alarm if the targets cross into alarm areas. It doesn't require operating personnel mostly. For target identification, it is often coupled with an electro optic camera sensor with slew to cue functionality. Such radar is characterized by its ability to detect movement at ground level of targets such as an individual walking or crawling towards a facility. The radar must be able to detect, for example, a single swimmer or diver at the water surface despite a heavy swell. It must discard nuisance targets caused by, for example, an animal. 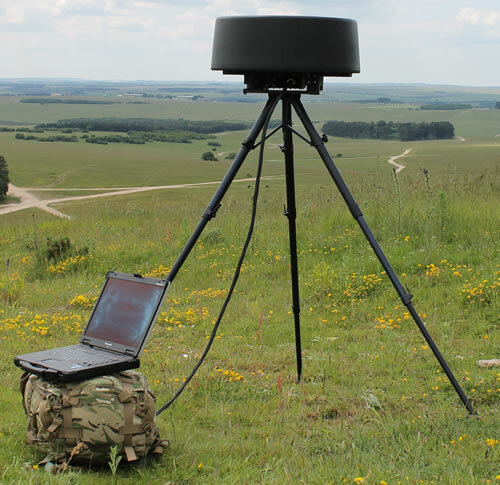 Perimeter radars for mobile use are lightweight and quickly and easily deployed on a tripod or as single mast solution on a vehicle for battlefield situational awareness. wildlife and game reserve observation.